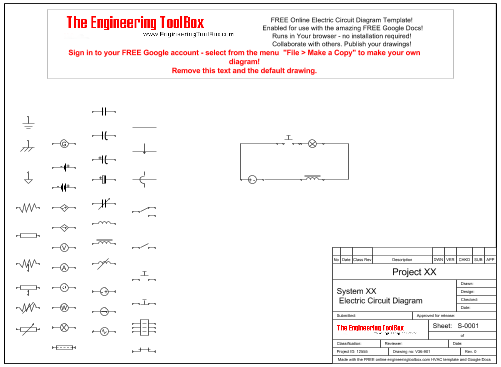 Use Google Drive to make and share electric circuit drawings. Log into your Google Account to save your own copy of this template. Share or publish your customized electric circuit drawing. Engineering ToolBox, (2012). Electric Circuit Diagram - Template. [online] Available at: https://www.engineeringtoolbox.com/electric-circuit-diagram-d_1829.html [Accessed Day Mo. Year].